Cinque Terre is a stunning part of Italy. It's a national park is made up of five small coastal villages that sit on cliffs along the waters edge. The villages of iomaggiore, Manarola, Corniglia, Vernazza and Monterosso each have their own character and personality. If you're hoping to stay at a hostel in the area, you'll find that most are actually located just outside of Cinque Terre, and you must take a bus or train to reach the area. There are a couple of small, basic hostels within the five villages. These hostels are an affordable option for travelers on a tight budget. How much do hostels in Cinque Terre cost? A good hostel for solo travellers and large or small groups. This hostel is handicap accessible. Ostello Tramonti is located in the ancient town of Biassa in a beautiful setting surrounding by green hills and water. There are many paths you can stroll along into the hills and enjoy the breathtaking views. Do take note that this hostel is not actually in Cinque Terre and you have to take a shuttle, provided for free, to reach the first town in Cinque Terre. This hostel has been recently renovated and is an affordable option for travellers looking to save some money. It's also one of the most popular hostels in Cinque Terre, so if you're traveling alone and want to meet other guests, it won't be hard. In total, there are fourteen rooms with four beds in each room. There's also one double room if you'd like a little privacy. The hostel has a restaurant and bar on site where you can enjoy meals that are prepared by an Italian chef. There is plenty of common space around and the hostel has a large terrace and a garden area where you can enjoy the moderate weather. There's also a lounge room where you can read books, watch television, or check out a movie. Some guests enjoy hanging out and playing ping pong as well. Other amenities to guests include free wi-fi and laundry facilities. The staff is very helpful and can offer all kinds of travel information in the area. There's a shuttle that provides service to the first town in Cinque Terre, Riomaggiore and it's a beautiful drive. A good hostel for groups. This hostel is located conveniently near both Cinque Terre and Porto Venere Natural Park. You do have to take a bus and train to reach Cinque Terre and there are boats that travellers can take to nearby islands. Although it's not actually in Cinque Terre, it is surrounded by beautiful scenery. The hostel has 50 beds that are split between nine rooms. Rooms range in size and include twins as well as rooms that sleep four or six people. Each room has plenty of natural light, as well as heating, and air conditioning. Private bathrooms are available. Each room also has a desk, locker, and reading light. 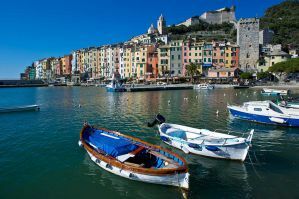 Ostello di Porto Venere also has a meeting room that can accommodate 85 seats. This room can be reserved for groups for an additional fee. The hostel staff is helpful and can offer you all kinds of information including transportation schedules, hiking maps, and restaurant recommendations. A good hostel for female travellers. Ostello Corniglia is located in the middle of the town of Corniglia. This is the third of the five villages that make up Cinque Terre National Park, and is a great option if you want to stay in a hostel that is actually within the park. The town is quaint and beautiful and the hostel has access to beautiful hiking trails that offer impressive views of the area. There are also many great restaurants and cafes nearby. The hostel has two dorms that are split by gender, so there is a male only dorm and a female only dorm. Each dorm has eight beds and guests have access to a locker. There are also private rooms available that are either doubles or triples. Private rooms have access to their own private bathrooms. The hostel itself is clean and basic. It is an affordable option for travellers who want to stay in a hostel in the heart of Cinque Terre. It's comfortable and the furnishings are decent, but the location can't be beat. The hostel does close for cleaning during the middle of the day, but you will likely be out exploring during this time anyway. Mar-Mar is the perfect place to relax in a quiet and peaceful setting after a busy day exploring the area's churches, architecture, and natural beauty. It's located in Riomaggiore, which is the most southern village of Cinque Terre. It's a great area to base yourself and has access to hiking and biking trails. If you're looking to experience an authentic Italian location, then this is a good option. The hostel is a good option if you want to stay in Cinque Terre but are on a strict budget. It offers a fourteen bed dorm that can feel a little crowded and but is a good value in a good location. It's a clean hostel with a light breakfast included in the price of the room. In general, the hostel does not have the most social atmosphere. You pay for the location, not the ambiance, but the location really can't be beat!